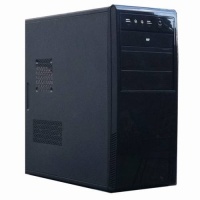 Here at Computer Service, we can build computer systems (AMD and Intel based) to do any job, be it basic internet and office use, video editing or heavy duty 'World of Warcraft'. If you want a machine to do a specific job, we can build it. All of our computer systems are built here in our workshop. We use brand new, standard industry size components for our systems. Every machine we supply is fully upgradeable at a later date and will work under Windows XP (subject to change), Windows Vista, Windows 7, Windows 8 or Windows 10. We offer 12 months return to base warranty on all our new machines with proof of purchase in the form of a printed Sales Receipt or Invoice. Prices for the machines listed below are our standard models. They all include Windows by default (but you can choose Windows 8.1 or 10 if you prefer) and come complete with keyboard, mouse and multimedia monitor. All prices include VAT at the current rate. Windows 7 and Windows 8.1 are eligble for the free upgrade to Windows 10. If you have the "Get Windows 10" icon down by the clock, you can run Windows 10. Please be advised: Individual components, specifications and prices are all subject to change at short notice.. This is our starter Dual-Core computer system. With 2Gb of DDR3 memory, a 500Gb hard drive and a 120Gb Solid State Hard Drive, an 18.5" multimedia monitor and a value keyboard abnd mouse this is a good value starter machine. Suitable for basic Internet use and Office work. Can be upgraded at a later date as your computer needs grow. Our standard Quad-Core complete system features the regular 120Gb Solid State drive, a 1Tb hard drive for storage and 8Gb Memory as well as a 18.5" monitor and a wireless keyboard and mouse, typically Microsoft or Logitech brand. This will handle pretty much anything non-gaming wise you can throw at it. Add a mid-range Graphics card and this will make a fine gaming machine. The six core system is ideal for those intensive computer operations that the power of two extra cores can speed up. Gaming wise you may not notice much of a difference. Like our other systems, a 120Gb SSD, 8Gb of memory and a 1Tb hard drive for storage is standard. The complete system adds a monitor and wireless keyboard and mouse. With 8Gb of memory, a 120Gb SSD, 1Tb HDD, and a monitor, keyboard and mouse, the 8 Core system will definitely cope with anything you throw at it, but bear in mind not all applications can use all eight cores. An Intel Quad-Core processor, SSD and a 1Tb HDD paired with a Corsair branded power supply makes this a super powerful and quiet computer system that, like it's AMD equivalent can make the basis of a good gaming machine. Like the others it has an 18.5" monitor and a wireless keyboard and mouse set. For the latest up-to-date prices and specifications on our machines, please contact us.